Flights are halted for two hours and cause residual delays. NEW YORK — A plane from Toronto slid into snow as it turned onto a taxiway after landing at John F. Kennedy International Airport on Sunday, halting flights at the airport for two hours and causing residual delays. “It could have been worse, a much worse scenario,” Jordan Houlton told reporters after he emerged from Delta Connection 4100 along with 34 other passengers and crew members about 90 minutes after the slippery diversion of the CRJ2 aircraft. 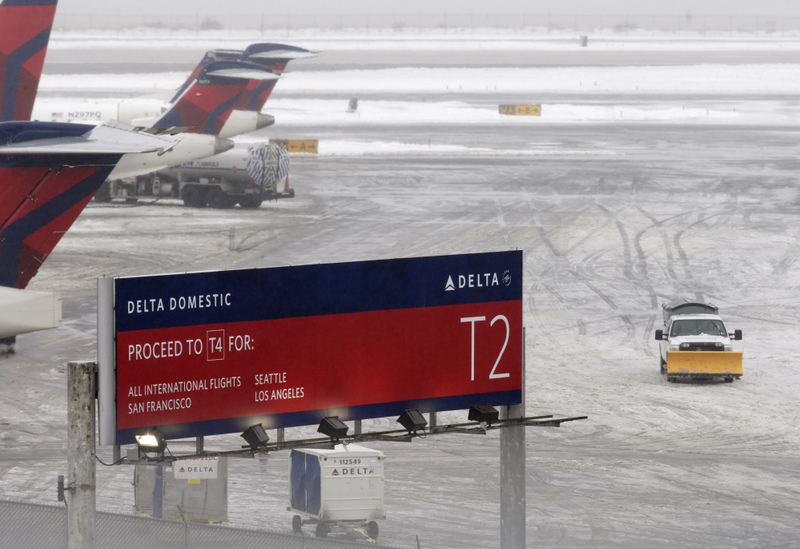 A snowplow makes its way on a slushy patch between two terminals after a Delta flight from Toronto to New York skidded off the runway into snow at Kennedy International Airport, temporarily halting all air travel into and out of the airport on Sunday. Federal Aviation Administration spokeswoman Kathleen Bergen said there was no immediate report of injuries after the plane landed safely at 8 a.m., only to lose its footing and slide into snow as it turned from the runway onto a taxiway. The plane was then towed to a gate with passengers on board, she said. Houlton, a 27-year-old teacher in Mexico, said he managed to sleep through the slide and didn’t learn until later that the plane had skidded off course. The Port Authority of New York and New Jersey, which operates the airport, said operations for domestic and international flights were suspended for about two hours because of slick runways, leaving passengers at crowded gates. Flights resumed after 10 a.m. on two of the airport’s four runways, but residual delays for passengers were expected to linger. The landing came two days after a major snowstorm dumped a half foot of snow in New York City, forcing the cancellation of hundreds of flights and stranding passengers both in the city and throughout the world who were heading to New York. Passengers from canceled flights continued to fill the few remaining seats on many planes already crowded by holiday travelers. The Delta Connection flight by Endeavor Air originated in Toronto. Endeavor Air was formerly Pinnacle Airlines. The flight also came a day after a small plane traveling to Connecticut after a tour of the Statue of Liberty made an emergency landing on the Major Deegan Expressway in the Bronx. Neither the pilot nor his two passengers were seriously injured.